With a place in this year's UEFA Champions League group stages on the line, Malmo travelled to Scotland for a match on Wednesday night for the first leg of their play-off against Celtic. Malmo's fans wasted no time in trolling the locals when they busted into a foul version of Pink Floyd's classic "Another Brick in the Wall", as they sung "Hey, Celtic - leave those sheep alone" at their bemused hosts. 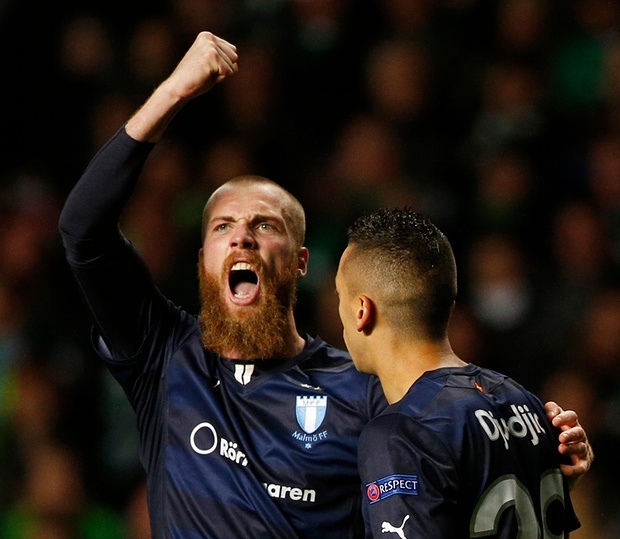 Celtic won the match 3-2, with two goals from Leigh Griffiths and one from Nir Bitton, but Jo Inge Berget’s goals in the 52nd and 94th-minutes gave Malmo two crucial away goals to take back to Sweden. "They are pigs, all of them, that’s the way it is. You just have to try to stay cool and do what we have to do on the pitch. Leigh Griffiths, well, I don’t know what to say, he behaved like a child, tugging shirts all the time." "There were some players who talked a lot. You probably know who I mean. They have a captain [Scott Brown] and a few others who like to talk. But that’s the way it is at this level. One player who came on [Nadir Ciftci] was not particularly nice. The first thing he wanted to do when he came on was to talk. He had more focus on that than his performance. And I don’t think it was to their advantage that they were running around focusing on other things." Malmo have promised to attack from the start in the second leg at home and Celtic will hope that will have to do a bit more than talk if they hope to progress.